Maruti has just unveiled the Future-S, a micro SUV concept that will go into production in the next year or so. The Future-S’ production model will essentially be a low cost SUV with the footprint of a hatchback. It’ll be priced and positioned well under the Vitara Brezza, as a high riding alternative to B-Segment hatchbacks. When launched, it’s likely to compete with the Mahindra KUV100, the only other micro SUV that’s currently on sale in India. Like Maruti, Hyundai is also developing a new micro SUV for the Indian market. 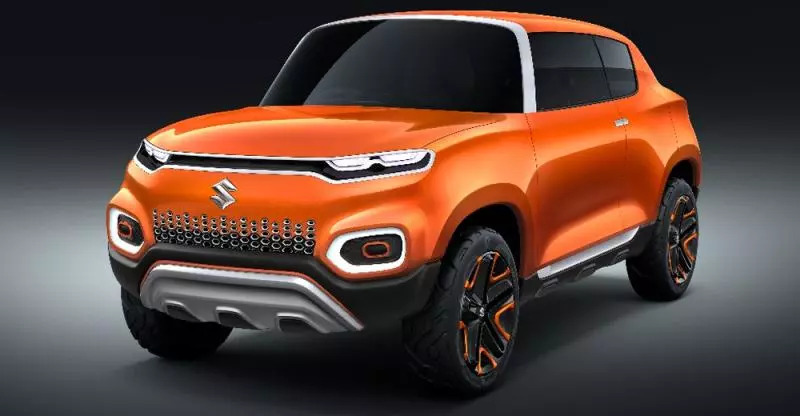 In terms of design, the Future-S gets a funky, new look, and looks like something that’s never been seen before from Maruti. Key design elements including the floating roof and the unique A-Pillar design that wraps around a youthful bubble windscreen. Maruti’s designers have been generous with prominent wheel arches, giving the Future-S plenty of muscle. The car rides on large wheels and has many other SUV styling cues such as skid plates and raised rear styling. The insides also continue the funky theme with white and orange accents, and a centrally placed infotainment-instrument cluster. Designed in-house by Maruti in India, the Future-S concept’s production version will use the HEARTECT platform that it’ll share with the all-new 2018 Swift hatchback. This platform extensively uses high-tensile, lightweight steel to keep weight low. The Future-S is also expected to dip into the Swift’s engine line-up, which means that the 1.2 liter K-Series petrol and the 1.3 liter Fiat Multijet turbodiesel are two likely engines for the new micro SUV. Maruti could also use a new diesel engine that Suzuki is currently working on for future cars from the brand. Expect both 5 speed manual and AMT options for the Future-S’ production variants. Mild-hybrid options are also likely on the new car considering tightening emission norms. The car is also likely to be electric-ready as that’s another future trend that no automaker can ignore.